In Pioneer Park in Dallas, past the statue of romantic cowboys and iconic longhorns, in a far corner of the park—a stone’s throw from the Kay Bailey Hutchison Conference Center—stands a monument. On closer inspection it honors Robert E. Lee, Stonewall Jackson, Jefferson Davis, and Albert Johnson. Rising above them all on a 60-foot column was a Confederate soldier—the object of highest honor. Plaques on the four sides of column extoled the heroic virtues of the soldiers of the different military branches. 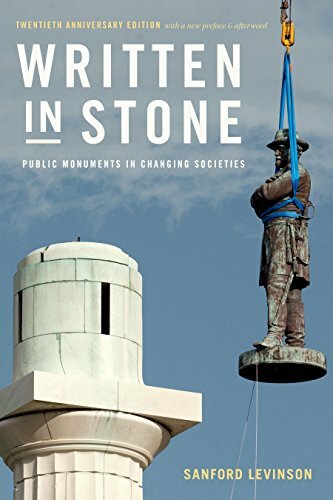 Eminent legal scholar Sanford Levinson’s 20th anniversary edition of the Written in Stone unpacks the enduring power of monuments with special emphasis on those dedicated to the American Confederacy (1861–1865), such as the one noted above. Levinson delves into this counterintuitive, ironic memorialization of history. For monuments are expressions of tradition. Commonly, tradition is associated with the dominant culture. It links present with past as an authentic, true narrative. Tradition, thus, asserts itself as the real primordial deal. Yet the Confederacy was defeated, its military decimated, along with a southern economy in full collapse. It was full-on humiliation. This is not generally the stuff of homage. At the center of Levinson’s analysis is the southern “lost cause” narrative, which asserts that the south was not defeated militarily but, rather, overwhelmed by a larger, better armed Union Army. This allows for leadership and soldiers to be re-valorized as brave and valiant heroes. The Pioneer Park Confederate monument is, thus, a finely distilled version of this vindication. To this we add two other interconnected revisionist narratives. First, and with all evidence the contrary, southern commemorators asserted that the Civil War was fought over state’s rights rather than slavery. Southern states’ declarations of secession were quite clear on this point: it was about preserving the institution of slavery. Second, there was an emergent “bright-side” narrative celebrating slave loyalty and dedication under conditions of paternal benevolence and humane treatment by their masters. Think here of Aunt Jemima or Uncle Ben about whom it was never about the pancakes or rice, but about cheerfully fulfilling the needs of the dominant class and happily knowing their place. Broader historical context for the paradoxical rise of Confederate monuments is only lightly touched upon in the book. Therefore, it is useful to provide a brief outline of that institutional history. Ladies’ Memorial Associations (LMA) sprung up almost immediately after the Civil War’s conclusion. LMAs would purchase land for reburials and hold annual days of remembrance. Women were permitted to lay flowers on graves. Former soldiers—not allowed into Confederate cemeteries—would march outside them in Confederate uniforms (minus insignia) and deliver fiery anti-reconstructionist speeches. LMAs morphed into the United Daughters of the Confederacy (UDC). The UDC constructed 1,500 monuments across America; pushed the states’ rights argument; and children were schooled in the Confederate catechism (e.g., states’ rights, bright-side narratives). While many across the country might have been surprised by the eruption over Confederate monuments, the groundwork for the reassertion of white nationalism has been percolating for a very long time. As Levinson notes in his new afterward, the identity politics embodied in these Confederate monuments is seemingly irreconcilable. Where can there be a middle ground? He addresses myriad recent clashes over monuments and cemeteries. As a long-time academic, he further explores the intertwining of universities and their benefactors with slavery along with varied responses from venerable institutions of higher learning. Monuments, we might conclude, are not much about history—only as a form of rhetorical top cover—but the political dynamics of the moment. Confederate monuments were born in a political moment with the explicit intention to craft a revisionist history of the Civil War. From that perspective, they serve as a manifestation of neo-slavery; a material-symbolic reminder to all about who is in power (and who is not). Monuments exist today in a political moment where “lost cause” culture and heritage as revisionist history is being weaponized anew. Are there any solutions to the polarizing identity politics embodied in monuments? In the original text, Levinson lays out possible solutions ranging from leaving them alone, tearing them down, or relocating them to museums where they can be properly contextualized (he leans distinctly toward the final option). The new afterward offers some insights into how Levinson’s thought may have evolved over the last 20 years. Levinson notes that it is incumbent upon us to memorialize those who suffered and lost their lives. He points to the creation of the very first memorial to African Americans who were lynched across America as an important step forward. The new National Memorial for Peace and Justice in Montgomery, Alabama takes on this courageous and emotionally wrenching subject to stunning effect. It is no accident that he ends with an examination of former New Orleans Mayor Mitch Landrieu’s controversial decision to remove Confederate monuments from public spaces in that city. Those monuments now reside in storage. *White, Hayden (1987) The Content of the Form: Narrative Discourse and Historical Representation. Baltimore: Johns Hopkins University Press.